Rachel Cochran is a PhD student in Global History at the University of North Carolina- Chapel Hill focusing on the modern histories of South and Central Asia. She is also currently pursuing a Duke-UNC graduate certificate in Middle East Studies. Her research interests include Islam, empire, global intellectual history, capitalist transformations and religion, and the concept of the Persianate, with a specific focus on histories of Muslim reform. Hina Muneeruddin is a doctoral student at the University of North Carolina at Chapel Hill in the Islamic Studies track of the Religious Studies program and currently pursuing her graduate certificate in Women and Gender Studies. Her research lies at the intersections of Islam, gender, race, affect, and performativity. More specifically, she is interested in the quotidian scenes of subjectivity of American Muslim women. Yasmine Flodin-Ali graduated from the University of Wisconsin Madison in 2014 with a major in Cultural Anthropology and minors in South Asian and African studies. In 2018, she graduated from Harvard Divinity School with a Master of Theological Studies. Yasmine is now a first year Islamic Studies PhD student at the University of North Carolina at Chapel Hill. She is interested in analyzing the relationship between religion and race as contemporary categories of differentiation. Yasmine’s dissertation research focuses on the racialization of South Asian and African American Muslims in the American South, from the 18th century through the present day. Arianne Ekinci is a PhD student in History at UNC-Chapel Hill studying how political states attempt to become culturally and historically-based nation-states through incorporation of borderland populations, with a particular focus on Uyghur experiences in the early PRC, and how minority or borderland populations negotiate citizenship and subjecthood as minorities, emigrés, and refugees. While Arianne has a strong background in China studies, her current research focuses on inter-Asian connections and the diverse experiences of women in the state. 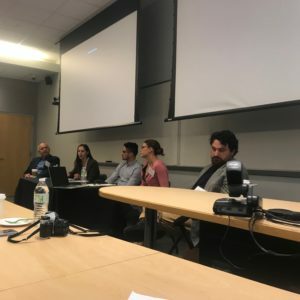 On March 2, 2019 the Islamicate Graduate Student Association (IGSA) at the University of North Carolina at Chapel Hill hosted the 16th Annual Duke-UNC Graduate Middle East and Islamic Studies Conference, the longest running graduate student conference focusing on Middle East and Islamic Studies in the country. The theme for this year’s conference was Muslims, Motherlands and Minoritization. The conference has long provided a forum for IGSA members to create spaces for the types of conversations that they believe are important and should be given priority, both within and beyond the academy. 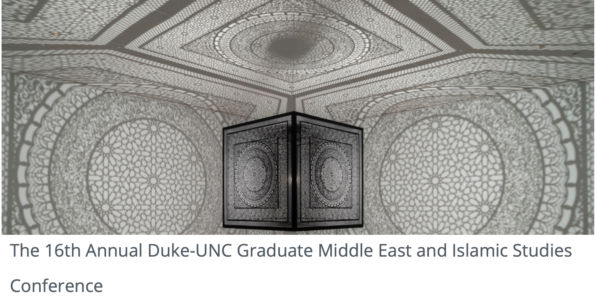 IGSA’s membership is made up of graduate students in various fields at Duke and UNC Chapel Hill whose work is related to Islamic Studies and Middle Eastern Studies. In 2019, the conference was organized by Rachel Cochran, a second year PhD student in History at UNC; Hina Muneeruddin, a second year PhD student in Religious Studiesat UNC; Yasmine Flodin-Ali, a first year PhD student in Religious Studiesat UNC; Arianne Ekinci, a second year PhD student in History at UNC; and Arpan Bhandari, a second year MA student in Religious Studiesat Duke. Twenty-five people, many in the US and some from abroad, submitted papers to the Conference. Visa requirements for international students can be difficult to navigate these days, but international participants have partaken in the conference in previous years via Skype. The conference organizers initially read through the abstracts and selected papers on the basis of their strength and relevance. Next, they read the full papers to narrow down their selection to eight papers that would work well in conversation with one another. The panel topics were chosen to fit the papers. The papers chosen for the conference this year largely fell into two themes: The first theme included papers focusing on Muslims as minorities, either in non-Muslim majority states or within the context of colonial empire. The second theme included papers examining minorities within Muslim communities, including ethnic minorities and sectarian minorities. Over the past few years the event has shifted to a hybrid conference-workshop format, so the papers were pre-circulated ahead of time amongst the participants and respondents, and respondents were encouraged to give ample feedback. On the morning of Saturday March 2 attendees gathered for coffee and breakfast in a spacious lecture-style room in UNC’s FedEx Global Education Center. In addditon to the eight presenters and three faculty respondents, about forty people attended the conference throughout the course of the day. The attendees were an eclectic mix of students, both undergraduate and graduate, faculty, and interested community members. Cemil Aydin, Professor of History at UNC, served as the faculty respondent for the first panel entitled, “Race, Racialization, and Minoritization.” Brittany Landorf, a first year PhD student in Islamic Civilizations Studies at Emory University, began the day with a presentation on French stage magicians who were brought to Algeria as part of the colonial project to demonstrate the scientific marvel of French rational thought in contrast to Algerian marabouts. Landorf argued that the marabouts and Sufism at large were painted as magical by the French, in a process of queering as abjection, which the French used to humiliate Algerians. Next presenter on the first panel was Zachary Faircloth, a Masters student in Religious Studies at the University of Florida. Faircloth presented a paper on white Muslim converts in the American South portrayed in the PBS short film, Redneck Muslim. Faircloth explored the convergence of a non-Muslim past in the American South with a Muslim present in a country where whiteness and Islam are often constructed as antithetical and demonstrated how white normativity is also constituted, in part, through religious identity. The last paper of the morning panel was delivered by Arianne Ekinci, one of the conference organizers. Ekinci presented on the integration of Uyghur women into the Chinese nation during the early years of the People’s Republic of China. By focusing on the life of Shalamaiti, an Uyghur woman trained to become a touring performer, she demonstrated the way in which the PRC appropriated a narrow interpretation of Uyghur culture for pro-state propaganda by stripping Uyghur ethnicity of its Islamic trappings in order to render it legible within the Chinese nation. Professor Aydin, the faculty respondent for the panel, highlighted the themes that connect the papers presented in the panel. He highlighted that despite their distinct focal areas and methodologies, the papers presented anexamination of power relations and injustices through the languages of religion, race, and ethnicity. Dr. Aydin challenged panelists to think through to what extent colonial or state conceptions of religious identity have been internalized. He said: “We have to look at how Muslim modernists have used and in some instances ironically reproduced colonial categories.” Lastly, Dr. Aydin draw attention to shared connections between white privilege in the context of the United States and Han privilege within China. Following Dr. Aydin’s response, audience members were invited to ask questions. The last hour of the panel took on a more free-form conversational format, with panelists speaking to one another and to the audience. An audience member asked why none of the papers took place in the Middle East, which led to a spirited conversation between the panelists and the organizers on the need to take seriously the study of Islam beyond the Middle East. When the first panel completed at noon, everyone took a one hour break for lunch. Attendees mixed with participants and continued to engage in conversationin a more informal setting. 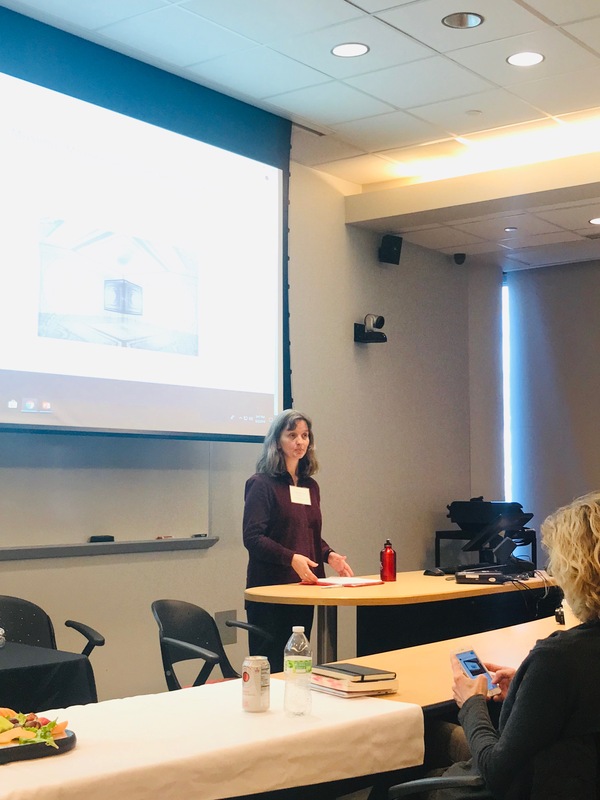 In this panel, Sawyer French, a Master’s student in Divinity at the University of Chicago, examined how the Indonesian state constructs and delineates the boundaries of religious identity through its religious curriculum in public schools. Through his fieldwork whichfocused on Islamic education classes in Indonesia, Sawyer showed how the state’s curriculum has contributed to an increasing alienation of Shia, Ahmadiyya, and Hizbut Tahrir, even while it has facilitated more unification between historically oppositional Sunni groups. Muhamad Rofiq Muzakkir, a PhD student in Religious Studies at Arizona State University, presented on Millah Ibrahim, a religious group in Indonesia which combines the teachings of Judaism, Christianity and Islam. Muzzakir demonstrated how certain articles of the constitution, legal devices such as the blasphemy law, and the Majelis Ulama Indonesia have worked together to construct Islamic orthodoxy in Indonesia and to marginalize Millah Ibrahim and other minority religious groups. 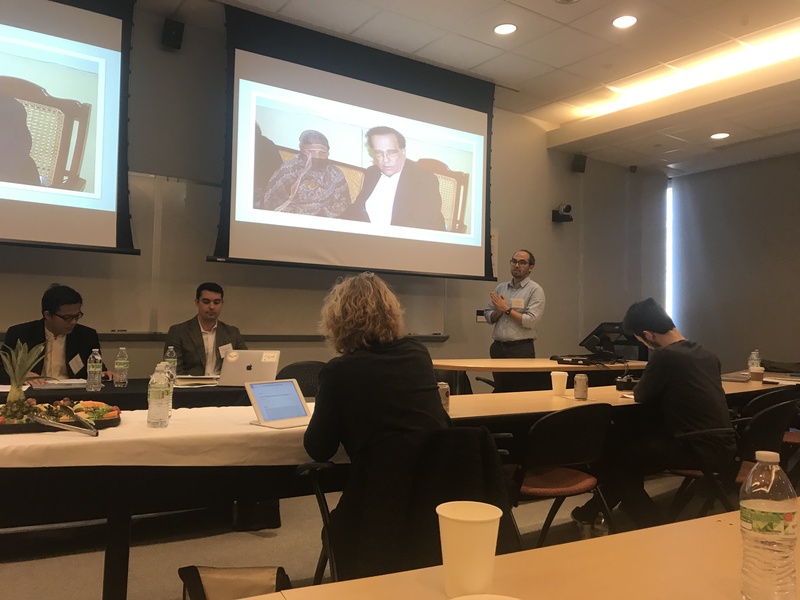 Sajjad Hussain, a master’s student in Global Studies at the University of North Carolina in Chapel Hill, presented on the rise of Tehreek-e Labbaik, a Barelvi movement which was established in the aftermath of the assassination of the governor of Punjab, Salman Taseer in 2011. 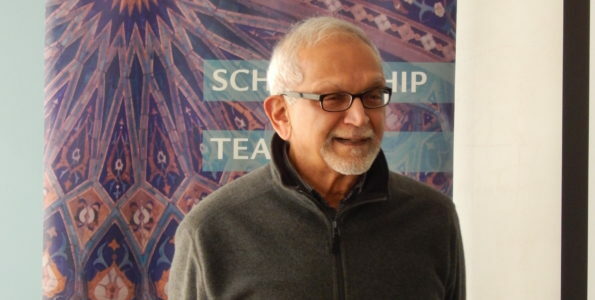 Through his examination of the political activism surrounding Aasia Bibi’s blasphemy trial, Sajjad complicated the persistent trope of equating Sufi practice with tolerance and situated the recent mobilization of a group of Barelvis in historical context. Robert Mogielnicki, a non-resident fellow at the Arab Gulf States Institute in Washington, a senior analyst with The Siwa Group, and a researcher at Magdalen College, University of Oxford, delivered a paper focusing on the emergence of free zones in Dubai in the 1980s. Mogielnicki argued that the emergence of these free zones preserved an operating space for the historically significant foreign merchant class, especially from Iran and Southeast Asia. 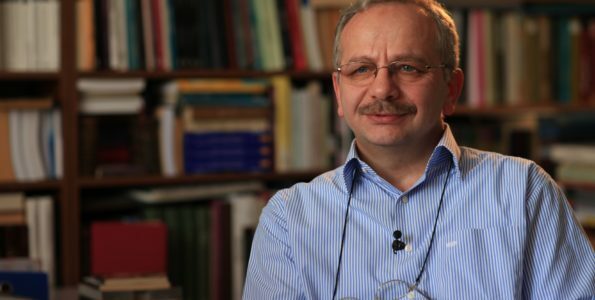 Mogielnicki extended his analysis of free zones beyond the economic realm to consider their religious and social impact. Professor Bigelow drew attention to a shared theme that emerged from the papers :the productive power of intolerance operating in sites where the nation-state is produced – in museums, schools, and state governing bodies. She challenged the panelists to also look for other kinds of resonances of the state outside of education and state institutions. Dr. Bigelow emphasized the importance of historically contextualizing religious movements and interrogating claims made about a movements’ continuity over time. She also highlighted the importance of paying close attention to the ways in which claims of authority within particular religious groups have also been contested. Dr. Juliane Hammer from UNC delivering concluding remarks. g oppressive structures that keep marginalized people imprisoned. Consequently, she mentioned, as with race and gender, religion is also a structure that operates within a hierarchy. What is Islam? Who is a Muslim? Who gets to decide and define these terms? Where are the boundaries? Who is allowed to critique religion and religious people? Ultimately, for Dr. Hammer, the production of knowledge is always inherently political. In this way, as scholars, we must be responsible for the politics of our scholarship as nothing is objective or detached about the ethical values and frameworks that inform our work. The 16th Annual Duke-UNC Graduate Middle East and Islamic Studies Conference in 2019, Muslims, Motherlands and Minoritization, proved to be an enriching and intellectually engaging opportunity for panelists and audience members alike. IGSA is deeply appreciative of all the sponsors who made the conference possible: Duke-UNC Consortium for Middle East Studies; Carolina Asia Center at UNC; UNC Curriculum in Peace, War, and Defense; UNC Department of History; UNC Department of Religious Studies; UNC Department of Romance Studies; UNC Department of Sociology; UNC Department of Women’s and Gender Studies; Duke Department of Religious Studies;Duke Islamic Studies Center; and UNC’s Southeast Asian Approaches Working Group. The Islamicate Graduate Students Association hopes to see another fruitful conference next year and encourages all Islamic and Middle East Studies graduate students to apply. Next year’s call for papers will be announced on the IGSA Facebook page and sent out to the Islamic Studies-AAR and Sociology of Islam listservs. Rachel Cochran is a PhD student in Global History at the University of North Carolina- Chapel Hill focusing on the modern histories of South and Central Asia. She is also currently pursuing a Duke-UNC graduate certificate in Middle East Studies. Her research interests include Islam, empire, global intellectual history, capitalist transformations and religion, and the concept of the Persianate, with a specific focus on histories of Muslim reform. Hina Muneeruddin is a doctoral student at the University of North Carolina at Chapel Hill in the Islamic Studies track of the Religious Studies program and currently pursuing her graduate certificate in Women and Gender Studies. Her research lies at the intersections of Islam, gender, race, affect, and performativity. More specifically, she is interested in the quotidian scenes of subjectivity of American Muslim women. Yasmine Flodin-Ali graduated from the University of Wisconsin Madison in 2014 with a major in Cultural Anthropology and minors in South Asian and African studies. In 2018, she graduated from Harvard Divinity School with a Master of Theological Studies. Yasmine is now a first year Islamic Studies PhD student at the University of North Carolina at Chapel Hill. She is interested in analyzing the relationship between religion and race as contemporary categories of differentiation. 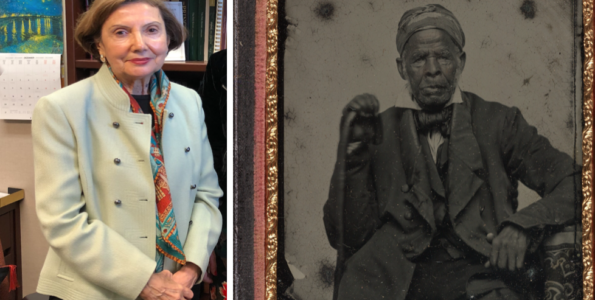 Yasmine’s dissertation research focuses on the racialization of South Asian and African American Muslims in the American South, from the 18thcentury through the present day. Arianne Ekinci is a PhD student in History at UNC-Chapel Hill studying how political states attempt to become culturally and historically-based nation-states through incorporation of borderland populations, with a particular focus on Uyghur experiences in the early PRC, and how minority or borderland populations negotiate citizenship and subjecthood as minorities, emigrés, and refugees. While Arianne has a strong background in China studies, her current research focuses on inter-Asian connections and the diverse experiences of women in the state.